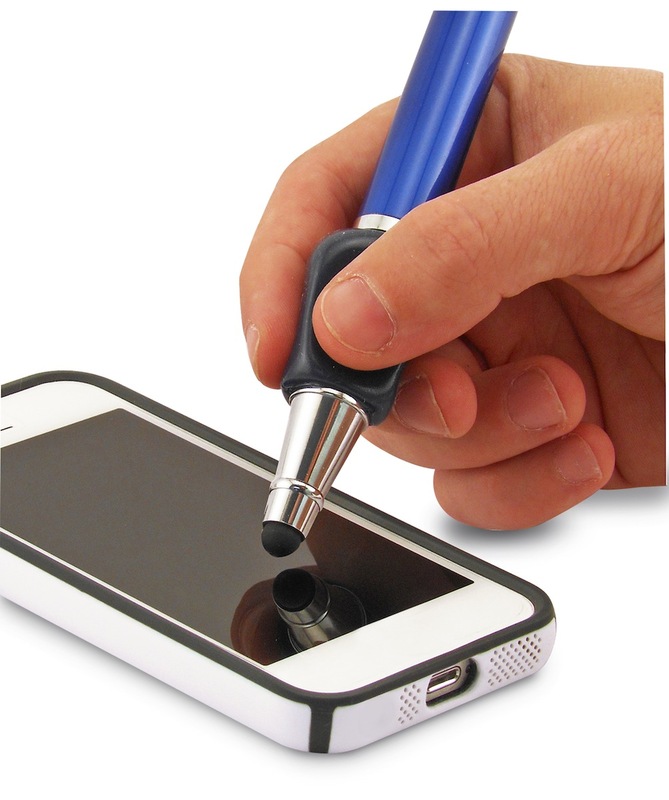 Ergo Stylus from The Pencil Grip Inc. I just received the Ergo Stylus from The Pencil Grip Inc. folks, and I am excited to trial this stylus having used The Pencil Grip , as my favorite utensil grip, with many, many kids for all kinds of tools (pencils, pens, crayons, markers, pencil colors, paint brushes, styluses …) in therapy. Trialing it on visual motor and handwriting apps the Ergo Stylus had the familiar feel of The Pencil Grip which can be used with either right or left hand. It has a similar weight and resistance when drawing or writing as the Cosmos Chunky Stylus by HHI and the Cosmonaut Stylus which provides “drag” causing some feedback when used on the iPad. 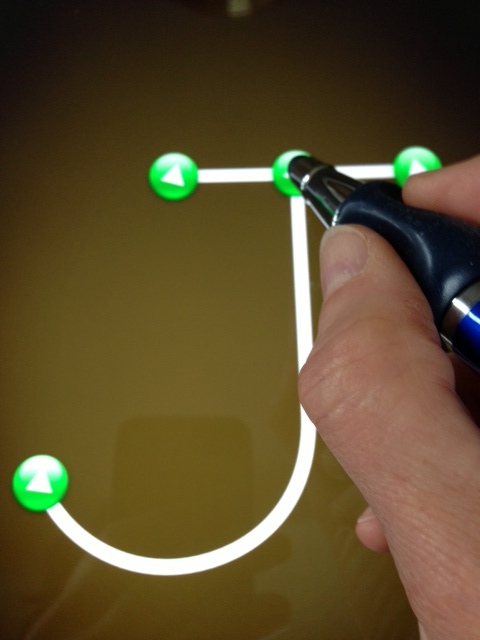 The Ergo Styluses tip is soft and flexible and allows good connectivity even when holding it at a narrow angle to the iPad screen, important for a stylus. One of the things I did find that when holding it at very narrow angle to the screen when writing, the metal shaft occasionally would tap on the screen, but which did no harm. This should not be a problem with most students using the Ergo Stylus as they typically do not have enough finger extension or control that would allow a narrow angle position of a writing tool. The Ergo Styluses tip as aforementioned is soft and flexible. The tips connectivity is good at all angles but experience has found these tips can tear or may be more easily damaged with use. A recommendation would be to provide replaceable tips for the Ergo Stylus for reuse and also allow easier replacement of The Pencil Grip if needed. I like the Ergo Stylus and would be a good stylus choice for students who need a somewhat heavier stylus and benefit from the use of a gripper when drawing or writing. At $13.00 it is affordable, but would be even more appealing if there were replaceable tips available. I will look forward to using the Ergo Stylus and making it available for students or adults to trial. Thank you to the The Pencil Grip Inc. for providing the Ergo Stylus – it is a welcome addition to my OT/AT mTool Kit! This entry was posted in Accessories, Drawing, Fine Motor Development, Handwriting, iPad, iPod, Occupational Therapy, Stylus, Writing and tagged accessories, Drawing, Handwriting, iPad, iPhone, iPod, occupational therapy, Stylus, Writing. Bookmark the permalink. 4 Responses to Ergo Stylus from The Pencil Grip Inc. I have nasty arthritis in my right hand, so this looks like a decent solution. Thanks. Jacqui, If you have access to The Pencil Grips, they can also be put on other styluses as long as you get connectivity when holding the stylus! The Ergo Stylus does have a nice feel however and has a responsive tip. Thanks for visiting Jacqui! Hope your school year is going well! That is certainly a concern voiced before. Now some styluses come with replacement tips – however that still doesn’t stop them from being damaged (oh, the cat ate it…?). The Cosmonaut is a bit more expensive (25.00) but when considering replacement might do the trick – at Amazon http://www.amazon.com/gp/product/B007EW9ISM?ie=UTF8&creativeASIN=B007EW9ISM&tag=otswiap-20.